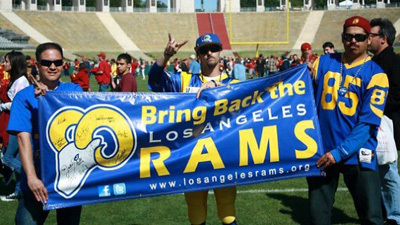 Like many people, I have mixed feelings about the Rams leaving St. Louis for Los Angeles. In some ways, they parallel the mixed feelings I’ve always had about football. Football strategy brings a dimension of chess to the world of athletics, but the inherent violence is in conflict with what might be called healthy competition (witness the Cincinnati – Pittsburgh playoff game of January 9). It has been said that life imitates baseball, and in many ways I think that is true; I hope it is. Baseball is essentially a happy game that runs the entire emotional gamut of the human experience. Life also imitates football, but football is a much more foreboding and grim game than baseball. Hearing how coaches, commentators and others say that what’s most important is the well-being of each player. This, while every effort is made to make players robots and cogs in the wheel of a well-oiled offense or defense. How the captains of industry, the owners and the NFL administrators, are driven by private avarice at the expense of the public good. Yes, it happens all over America (and the world), but nothing exemplifies it better than the NFL. How the League incessantly engages in self-congratulation for being so charitable – something that is easy to do when you’re wealthy. Just like Republicans, they’re charitable at the expense of supporting justice. Not a word about the “haves” in society having an obligation to help those who are most in need (i.e. support for a government social and economic safety net). The omnipresence of gaming the system, whether it’s the illegal or questionable drugs that players take or the gambling by tens of millions of addicted fans. The organizational psychology of both winning and losing coaches. Bottom line is that some nice guys finish first and some nice guys finish last. Tyrants also take turns winning and losing. Go figure. The empty seats at the end of virtually all games, indicative of how many fans love the game so much that they can’t wait to beat others out of the venue to get home first. The “officials’ time-outs” that come at the most non-natural of times and thoroughly interrupt the game, but are necessary because the game is really just a vehicle to drive viewers to the commercials. The arc of the long pass (captured so beautifully by NFL films); the pass that falls into the hands of a receiver in stride. The fact that some really decent human beings can play this often-savage game and come out with their personalities intact. The fun of being a fan and wondering whether the quarterback-impaired Rams will look outside the box for bad-boy Johnny Manziel or good-soldier improviser Robert Griffin III. Also, isn’t it about time for the Rams to at least have a high level African-American coach? What the Rams do on a day-to-day basis will become more and more distant to me, and I’ll miss that. But maybe that won’t last forever. “Shark” and basketball’s Dallas Mavericks owner Mark Cuban said a year ago that the NFL will self-implode in ten years. I could kind of go for that, no more violent tackle football. Instead we could have a low-budget friendly Touch Football League featuring the athleticism and the mental rigor and creativity that makes football so great. Well, I’m dreaming wildly, while the Rams are simply California dreaming.